For other uses, see Bethel (disambiguation). Bethel (Ugaritic: bt il, meaning "House of El" or "House of God", Hebrew: בֵּית אֵל ḇêṯ’êl, also transliterated Beth El, Beth-El, Beit El; Greek: Βαιθηλ; Latin: Bethel) is a toponym often used in the Hebrew Bible. At first it was a place where Jacob dreamt of seeing angels and God, which he therefore named Bethel, "House of God". The name is further used for a border city located between the territory of the Israelite tribe of Benjamin and that of the tribe of Ephraim, which first belonged to the Benjaminites and was later conquered by the Ephraimites. Eusebius of Caesarea and Jerome describe Bethel in their time as a small village that lay 12 Roman miles north of Jerusalem, to the right or east of the road leading to Neapolis. Most academics identify Bethel with the Arab West Bank village Beitin, a minority opinion preferring El-Bireh. Ten years after the 1967 Six-Day War, the biblical name was applied to the Israeli settlement of Beit El, constructed adjacent to Beitin. In several countries—particularly in the US—the name has been given to various locations (see Bethel (disambiguation)). Edward Robinson identified the Arab village of Beitin in the West Bank with ancient Bethel in Biblical Researches in Palestine, 1838–52. He based this assessment on its fitting the location described in earlier texts, and on the philological similarities between the modern and ancient name, arguing that the replacement of the Hebrew el with the Arabic in was not unusual. Most academics continue to identify Bethel with Beitin. David Livingstone contradicts this view, based on the lack of positive identification by means of inscriptions and relying on the distance from Jerusalem according to Eusebius and Jerome. He identifies Bethel with El-Bireh, suggesting that Beitin might be biblical Ophrah. 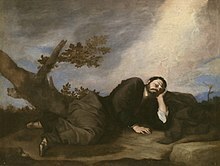 Depiction of Jacob's dream at Bethel, by José de Ribera. Bethel is mentioned several times in Genesis. It is first mentioned in Genesis 12 and 13, as a place near where Abram stayed and built an altar on his way to Egypt and on his return. It is said to be close to Hai (Ai) and just to the west of it. More famously it is mentioned again in Genesis 28, when Jacob, fleeing from the wrath of his brother Esau, falls asleep on a stone and dreams of a ladder stretching between Heaven and Earth and thronged with angels; God stands at the top of the ladder, and promises Jacob the land of Canaan; when Jacob awakes he anoints the stone (baetylus) with oil and names the place Bethel. Another account, from Genesis 35 repeats the covenant with God and the naming of the place (as El-Bethel), and makes this the site of Jacob's own change of name to Israel. Both versions state that the original name of the place was Luz, a Canaanite name. Bethel is mentioned again in the book of Joshua 7:2, 8:9 as being close to Ai and on the west side of it; in this episode Joshua sent men from Jericho to capture Ai. At 16:1 it is again said to be next to Luz, near Jericho, and part of the territory of the descendants of Joseph (that is Manasseh and Ephraim, cf. Joshua 16:4). In the book of Judges 1:22 ff the descendants of Joseph capture the city of Bethel, which again is said to have previously been called Luz. At Judges 4:5 the prophetess Deborah is said to dwell at Bethel under the palm-tree of Deborah (presumably a reference to Genesis 35:8, where another Deborah, the nurse of Jacob's mother Rebecca, is said to have been buried under a tree at Bethel). Bethel is said in Judges 4:5 to be in Mt Ephraim. At Judges 20:18, where the Hebrew Beth-El is translated in the King James Version as the 'House of God', the people of Israel go to Bethel to ask counsel of God when they are planning to attack the Benjaminites at the battle of Gibeah. They make a second visit (Judges 20:26) after losing the battle. Bethel was evidently already an important religious centre at this time; so important in fact that the Ark of the Covenant was kept there, under the care of Phinehas the grandson of Aaron (Judges 20:27 f). At Judges 21:19, Bethel is said to be south of Shiloh. At the next mention of the Ark, in 1 Samuel 4:3, it is said to be kept at Shiloh. In the book 1 Samuel 7:16, it is said that the prophet Samuel, who resided at Ramah, used to make a yearly circuit of Bethel, Gilgal and Mizpah to judge Israel. At I Samuel 10:3, Samuel tells Saul to go to Bethel to visit the 'Hill of God', where he will meet a group of prophets coming down from the high place with a 'psaltery, and a tabret, and a pipe, and a harp'. It appears that there was a Philistine garrison there at that time. Bethel is mentioned again in I1 Samuel 13:2 and 2 Samuel 30:27. After the kingdom of Israel was split into two kingdoms on the death of King Solomon (c.931 BC), Jeroboam, the first king of the northern Kingdom of Israel, made two calves of gold (1 Kings 12:28 ff) and set one up in Bethel, and the other in Dan in the far north of his kingdom. This was apparently to make it unnecessary for the people of Israel to have to go to Jerusalem to worship in the temple there. It seems that this action provoked the hostility of the Judaeans. A story is told at 1 Kings 13:1 ff of how a man from Judah visited the shrine at Bethel and prophesied that it would eventually be destroyed by Josiah. At 2 Kings 2:1 ff the prophets Elijah and Elisha are said to have visited Bethel on a journey from Gilgal to Jericho shortly before Elijah was taken up to heaven without dying (2 Kings 2:11). Later, when Elisha returned alone to Bethel, he is said to have been taunted by some young men (not 'young boys' as it is translated in some English Bibles) as he climbed up to the shrine, and cursed them; whereupon 42 of the young men were killed by bears (2 Kings 2:23 ff). Bethel is next mentioned in connection with the tenth king of Israel, Jehu (c. 842-815 BC). Despite his killing of the prophets of Baal and destruction of their temple, it is said that Jehu continued to tolerate the presence of the golden calves in Bethel and Dan (2 Kings 10:29). The shrine at Bethel apparently avoided destruction in the Assyrian invasions of the Kingdom of Israel in c. 740 and 722, but was finally completely destroyed by King Josiah of Judah (c. 640-609 BC). Bethel is mentioned in Ezra 2:28 and Nehemiah 7:32 as being resettled at the time of the return of the exiles from Babylon. A few years later the prophet Hosea (8th century BC) speaks (at least according to modern translations) of the "wickedness" of Bethel (Hosea 10:15) and Jeremiah (6th century BC) speaks of the "shame" which it brought on Israel (Jeremiah 48:13). Hosea 13:1–3 describes how the Israelites are abandoning Adonai for the worship of Baal, and accuses them of making or using images for 'idol' worship. Chief among these, it appears, was the image of the bull at Bethel, which by the time of Hosea was being worshipped as an image of Baal. Bethel was again inhabited and fortified by Bacchides the Syrian in the time of the Maccabees. Josephus tells us that Bethel was captured by Vespasian. Robinson notes that after the writings of Eusebius and Jerome, he found no further references to Bethel in the written historical record. However, he notes that the ruins at Beitin are greater than those of a village and seem to have undergone expansion after the time of Jerome, noting also the presence of what appear to be ruins of churches from the Middle Ages. ^ Bleeker and Widegren, 1988, p. 257. ^ a b c Robinson and Smith, 1856, pp. 449–450. ^ a b Harold Brodsky (1990). "Bethel". In the Anchor Yale Bible Dictionary. 1:710-712. ^ a b c David Livingston, Locating Biblical Bethel, Associates for Biblical Research, 14 April 2008, also published in Bible and Spade, winter 2011 issue. Accessed 15 April 2019. ^ Stephen L. Cook (2004). The Social Roots of Biblical Yahwism, Part 2. Society of Biblical Literature. p. 90. Kelso, James Leon; Swauger, James L. (1968). The excavation of Bethel (1934-1960). American Schools of Oriental Research.